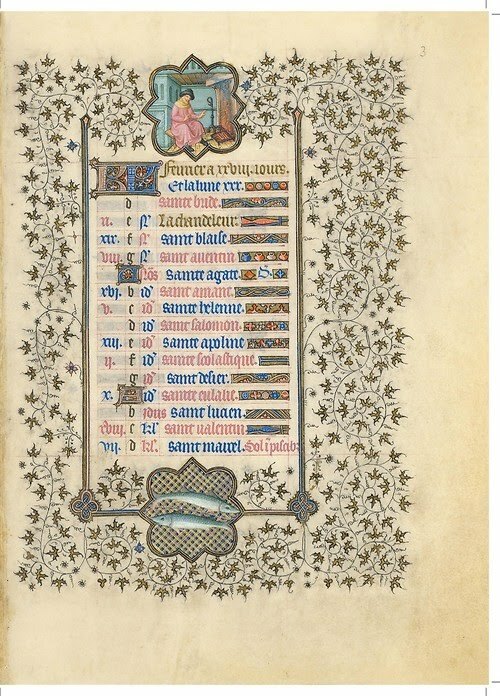 Jean de France, duc de Berry commissioned the Belles Heures, an elaborate calendar and religious volume, in 1405. 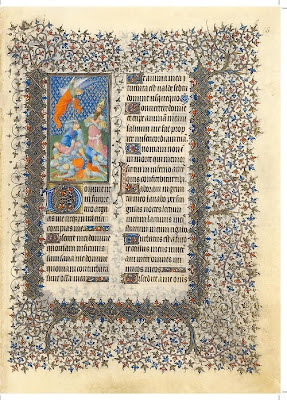 Created by the German Limbourg brothers, Herman, Paul, and Jean over five years in Paris, the illuminated manuscript is a mere 9x6 inches, with many paintings no bigger than a postage stamp. My friend Emer and I spent half the day in a dark room at the Metropolitan Museum of Art in New York City on Sunday with our glasses first on (to read the extended labels) and then off (to squint through the glass at the tiny images), finding a little relief after discovering the stockpile of magnifying glasses at the guard station. We emerged into the sunlight three hours later, dizzy and disoriented, and in my case in need of a chiropractor, since each of the four hundred pages was suspended in display cases at about five feet high. 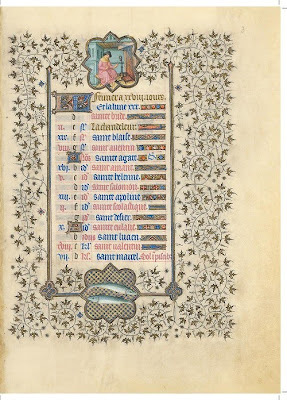 It was Easter, and although we couldn’t read the Latin and French text, our intense study of the Limbourg’s paintings of the Psalms, Jesus’ death and resurrection, and the martyrdom of fifty saints surely gained us points upstairs. As we headed to meet my George and Emer’s friend Jack (both of whom opted to sleep in) for fancy egg dishes and mimosas, we agreed that we’d as good as gone to Mass. 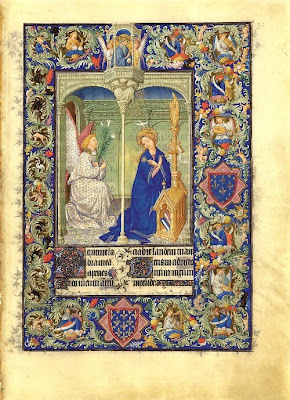 The Limbourg brothers painted these pages six hundred years ago, and yet I easily imagine the boys, apprenticed first to a goldsmith as young adolescents and then employed in their late teens by the duc de Berry, engrossed in creating one of the greatest works in the history of western art. To complete one page must have taken weeks, and had they not all three died of plague before reaching their thirtieth birthdays, surely they would have gone blind from their detailed work. Just a guess, but I am probably the first visitor to think about George Rodrigue while viewing these medieval paintings. In recent weeks I’ve posted stories about his paintings of giant chickens and rabbits, along with his current interest in creating large-scale works. There is perhaps no more bold (or possibly offensive to some) a comparison than that between a two-inch square ‘jewel’ from the Belles Heures and a six-foot Blue Dog canvas! (As I’ve quoted many times in this blog, architect A. Hayes Town told George years ago, “Treat your painting like a jewel. If it’s precious to you, it will be precious to others as well.” To this day, George approaches his canvas in this way, no matter what the scale). And yet there was a time that George painted dozens of miniatures. 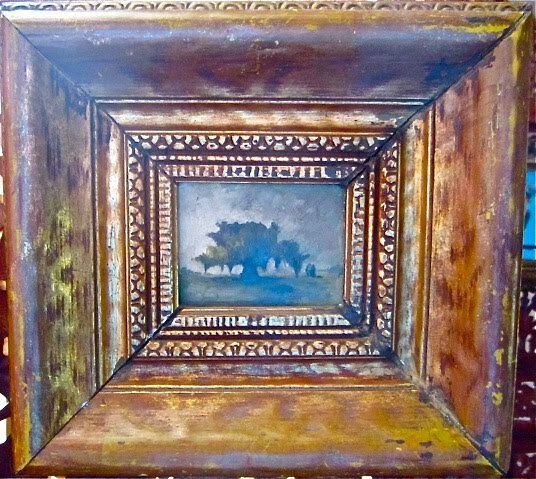 We have several of these 2x3 inch paintings in our home, all landscapes painted in the early 1970s. It’s ironic that I easily imagine the Limbourg brothers and yet struggle to imagine George straining over something so small, especially when I know that he painted landscapes as large as eight feet across during this same period. I asked him about the tiny canvases. Was this something he did just out of curiosity? Or maybe because he thought he could sell them easier? His answer surprised me. It had nothing to do with the paintings or their salability. Rather it had everything to do with the frames. In a way, the limitations of a frame are like the limitations of a book. The Limbourg brothers painted on parchment created from animal skins, a process nearly as time-consuming as painting the pages. Today we’re spoiled when it comes to these materials, but in the year 1400, stretching the skins, choosing and shaping just the right bird’s feather for a quill, and acquiring, grinding, and blending each color, required intense labor and skill. Part of his decision to paint miniatures was financial. 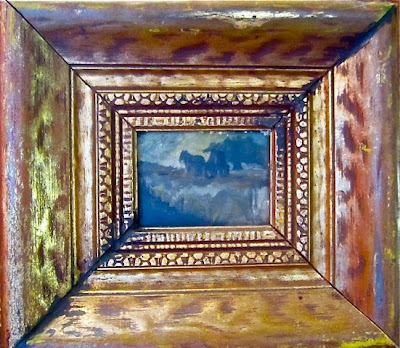 George cut most of his frames himself from old moldings. But even this, at $4 a foot, was expensive. 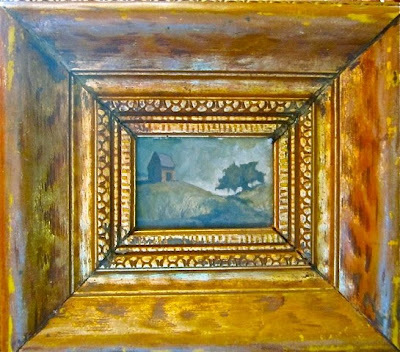 Cutting a frame resulted in extra, odd pieces at the corners, usually about eight inches altogether, the sort of pieces normally discarded by a professional framer. He combined these as described above (and as he explained with a diagram on the back of our lunch receipt today at the Museum of Modern Art). To create the painting, he stretched a tiny canvas to fill the frame, usually 2x3 inches, and held it in his left hand while painting with his right. The images were too small to use his mahlstick (a sword that steadied his hand). After selling several of these finished paintings and frames at $50 each, he could afford enough molding for a larger painting. Indeed even with his larger paintings, I’m reminded of Emer and I, with glasses on and off, struggling to see the Belles Heures. 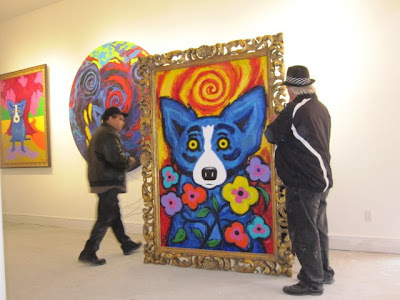 George wears his reading glasses as he paints, then rolls his chair six feet back, removes his glasses, and then slides up to his easel to make changes. It’s a constant back and forth, a move he seems to make subconsciously, not realizing that within every minute he probably rolls his chair and removes his glasses two or three times. Most of George’s recent detailed work appears in some of his silkscreen designs and even on a necktie, which he created for his own use. Why doesn’t he sell the neckties? For the same reason he doesn’t produce tiny Blue Dog paintings and prints. He doesn’t want to. He doesn’t like to. Remember, even with the tiny landscapes, George was more excited about the challenges involved in creating the frame than he was about the painting. When I looked at the Limbourg brothers’ manuscript, I thought about their devotion to a project, a passion that took over their lives. Although it resulted in income, it was much more than that. I imagine that the Limbourg brothers thought about their project all of the time and that they felt rather fortunate to be paid for it. Like them, George makes a good living painting what he wants. The rest is just lagniappe --- items more fun for him when created on impulse as one-of-a-kind or in small quantities for himself and friends, rather than mass produced and sold on every corner or (in the case of a tie or t-shirt) worn by every stranger. (I’m reminded of our one-of-a-kind ceramic Blue Dog platters, which George painted over several days at a paint-your-own-pottery coffee shop). It turns out that the Limbourg brothers also created lagniappe in the form of fake books, gold medallions, and other special items as gifts for the Duke, items supposedly prized among his greatest possessions, but for which they refused to be paid or create in multiples. Similarly, I’m obsessed with this blog, exploring new paths with these vignettes, because I enjoy writing like I speak, in my own unedited style, breaking rules when I feel like it, running on sentences in the same way they ramble through my brain, embracing clichés at times (because let’s face it, sometimes they’re on the money), connecting six hundred year old religious manuscripts to forty year old Rodrigue landscapes, and every once in a while interjecting the banished exclamation point! Granted, unlike the Limbourg brothers and George Rodrigue, I’m not paid (directly) for these musings. And although my talent is miniscule in comparison to their miniatures, and my legacy probably will die out with my family, I remain devoted to my project. 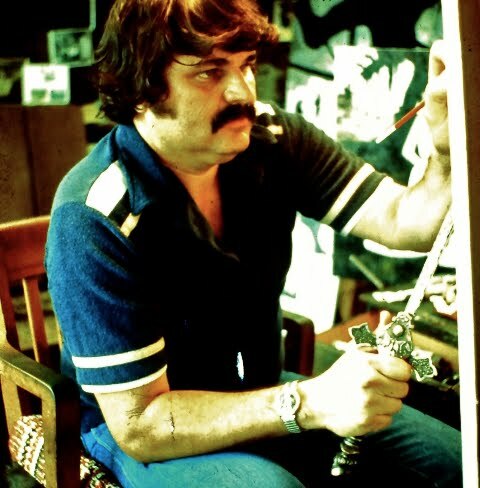 Did George Rodrigue paint tiny landscapes just for the money? How about the Blue Dog? 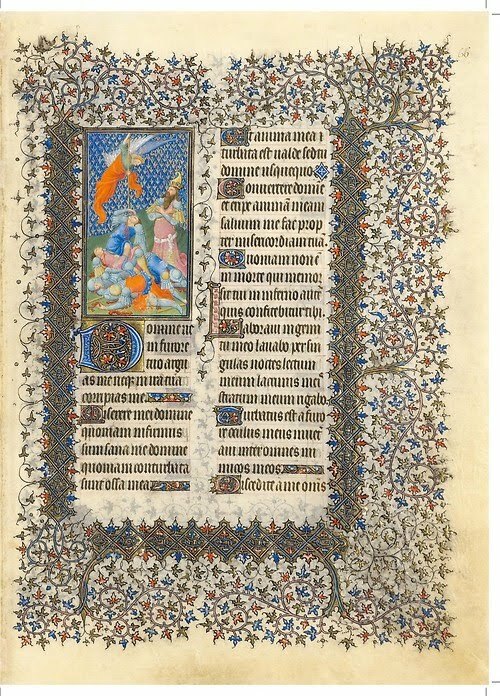 Did the Limbourg brothers spend five years on a manuscript just for their patron? I propose that it’s the other way around. Just because something is popular or commissioned (or tiny) does not make it less important, less inspired, less personal, or of lesser quality. 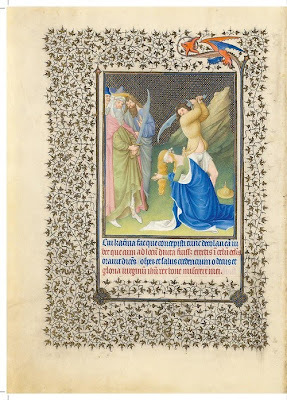 Rather, the artist’s importance and the quality of their work makes them worthy of compensation and, fortunately for George and the Limbourg brothers, someone took notice.